Debian 8.7 GNU/Linux has been released at January 14th 2017. This is an update for Debian 8 (stable, Jessie) mainly for fixing security issues. Here I listed download links for 64 bit and 32 bit versions including torrent links. This article is intended as simple guide for new comers into Debian. 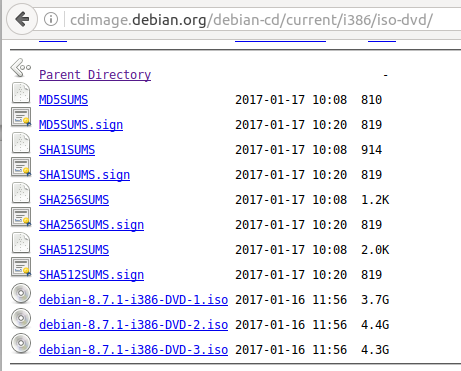 It's difficult for beginners to find exactly where certain Debian download links are, because there are too many links available. So here I split this article to Section A and Section B, showing normal download links and torrent links respectively; plus Section C showing hash sums. 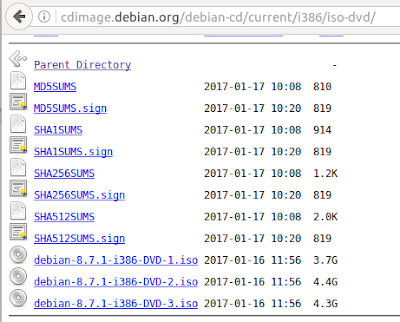 Please remember that Debian is developed very rapidly so maybe in the day you visit these links, they will have updated with the new version. So I chose to use current/ directory for each download below to make sure you will never miss any further link. Tip 1: if you want to get ISO only for system installation, download DVD 1 or CD 1 and leave the rest. Tip 2: always pay attention to the URL you are copying. See the directory names such as iso-dvd/, iso-cd/, bt-dvd/, bt-cd/. Those names represent the type of ISO files. So just edit the URL and you can go anywhere you want without changing browser tabs.